Kil Kilcauley of North Port has seen a lot of life in his 97 years of living. He’s fought in three of this country’s wars–World War II, Korea and Vietnam–and lived to tell about it. 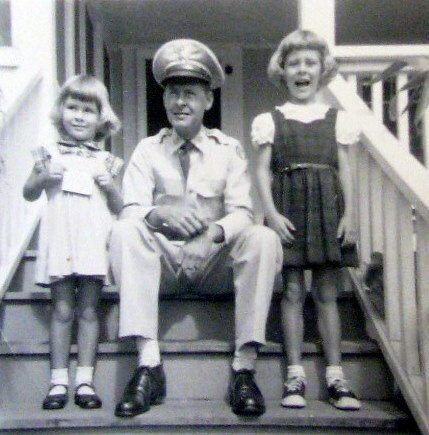 In World War II he began as a “Ninety-day Wonder.” He went to OCS (Officer’s Candidate School) shortly after joining the Army in November 1942. Graduating a second lieutenant his first duty station was Hawaii. Their equipment was so primitive the radar operators weren’t sure what they were seeing on their screens if the object was 25 miles away. The most exciting thing that happened while Kil was staffing one of the island’s radar sites: “Our radar picked up something that seemed to be a half mile off shore moving slowly. We had a problem identifying what it was, so we contacted the Air Force and they sent planes up to check it out. “What we found out was that the Coast Guard was repositioning a field gun along the beach. From what we could see on our radar units it seemed to be just off shore and we first thought it might be an enemy submarine. As a consequence the whole island went into a blackout until they could identify the object,” he said with a chuckle more than six decades later. Later on during the war he was reassigned as a transportation officer in Hawaii. At war’s end Kil had a job running an Army motor pool in the Honolulu. At the same time his wife, Lois, was a member of the Women’s Air Raid Defense. 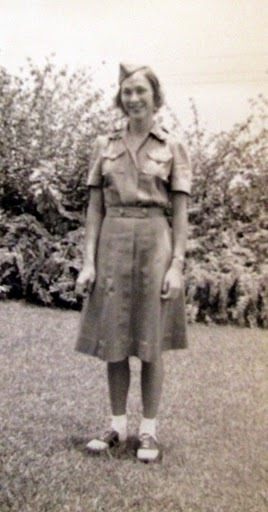 Her job was to help coordinate the transmission of Teletype messages from their post that provided air defense information to higher headquarters. FROM SUPREME COMMANDER FOR THE ALLIED POWERS. PURSUANT TO THE ACCEPTANCE OF THE TERMS OF SURRENDER OF THE ALLIED POWERS BY THE EMPEROR OF JAPAN, THE JAPANESE IMPERIAL GOVERNMENT AND THE JAPANESE IMPERIAL HEADQUARTERS. THE SUPREME COMMANDER FOR THE ALLIED POWERS HEREBY DIRECTS THE IMMEDIATE CESSATION OF HOSTILITIES BY JAPANESE FORCES. THE SUPREME COMMANDER FOR THE ALLIED POWERS IS TO BE NOTIFIED AT ONCE OF THE EFFECTIVE DATE AND HOUR OF SUCH CESSATION OF HOSTILITIES, WHEREUPON ALLIED FORCES WILL BE DIRECTED TO CASE HOSTILITIES. THE SUPREME COMMANDER OF THE ALLIED POWERS FURTHER DIRECTS THE JAPANESE IMPERIAL GOVERNMENT TO SEND TO HIS HEADQUARTERS AT MANILA, PHILIPPINE ISLANDS, A COMPETENT REPRESENTATIVE EMPOWERED TO RECEIVE IN THE NAME OF THE EMPEROR OF JAPAN, THE JAPANESE IMPERIAL GOVERNMENT AND THE JAPANESE IMPERIAL GENERAL HEADQUARTERS CERTAIN REQUIREMENTS FOR CARRYING INTO EFFECT THE TERMS OF SURRENDER. THE REPRESENTATIVE WILL BE ACCOMPANIED BY COMPETENT ADVISORS REPRESENTING THE JAPANESE ARMY, THE NAVY AND THE JAPANESE AIR FORCE, THE LATTER ADVISOR WILL BE THOROUGHLY FAMILIAR WITH AIRDROME FACILITIES IN THE TOKYO AREA. PROCEDURE FOR TRANSPORT OF THE ABOVE PARTY UNDER SAFE CONDUCT IS PRESCRIBED AS FOLLOWS: PARTY WILL TRAVEL IN A JAPANESE AIRPLANE TO AN AIRDROME OF THE ISLAND OF IE SHIMA, FROM WHICH POINT HE WILL BE TRANSPORTED TO MANILA, PHILIPPINE ISLANDS IN A UNITED STATES AIRPLANE. THEY WILL BE RETURNED TO JAPAN IN THE SAME MANNER. PARTY WILL EMPLOY AND UNARMED AIRPLANE. SUCH AIRPLANE WILL BE PAINTED ALL WHITE AND WILL BEAR UPON THE SIDES OF THE FUSELAGE AND TOP AND BOTTOM OF EACH WING GREEN CROSSES EASILY RECOGNIZABLE AT FIVE HUNDRED YARDS. THE AIRPLANE WILL BE CAPABLE OF INFLIGHT VOICE COMMUNICATIONS, IN ENGLISH, ON FREQUENCY OF 697 KILOCYCLES. AIRPLANE WILL PROCEED TO THE AIRDROME OF THE ISLAND OF IE SHIMA, IDENTIFIED BY TWO WHITE CROSSES PROMINENTLY DISPLAYED IN THE ENTER OF THE RUNWAY. THE EXACT DATE AND HOUR THIS AIRPLANE WILL DEPARTMENT FROM SATA MISAKI, ON THE SOUTHERN TIP OF KYUSHU. THE ROUTE AND ALTITUDE OF FLIGHT AND ESTIMATED TIME OF ARRIVAL IN THE LE SHIMA WILL BROADCAST SIX HOURS IN ADVANCE, IN ENGLISH, FROM TOKYO ON A FREQUENCY OF 1625 KILOCYCLES. ACKNOWLEDGMENT BY RADIO FROM THIS HEADQUARTERS OF THE RECEIPT OF SUCH BROADCAST IS REQUIRED PRIOR TO TAKE-OFF OF THE AIRPLANE, WEATHER PERMITTING. THE AIRPLANE WILL DEPART FROM SATA MISAKI BETWEEN THE HOURS OF 08:00 AND 1:00 TOKYO TIME ON THE 17 OF AUGUST 1945. IN COMMUNICATIONS REGARDING THIS FLIGHT, THE CODE DESIGNATION “BATAAN” WILL BE EMPLOYED. The Teletype message from Gen. Douglas MacArthur was tucked away in a clear, plastic freezer bag hidden in a desk drawer for decades. It was in perfect condition after more than 60 years in dark seclusion. Kil, her husband’s, next war time adventure involved MacArthur at Inchon. The Korean War was underway and the World War II general took command of Allied forces fighting the Communist on the Korean Peninsula. “I was in-charge of all the equipment for unloading ships at Inchon,” Kil said. “It was a particularly tough job because the tide at Inchon rose and fell 40 feet or more in the harbor. “Because of the extreme tide conditions we had to construct this bathtub affair that allowed us to bring ships in to port at high tide and maintain the water level when the tide went out. When the high tided returned we could open the loch and allow the ships to return to sea,” he explained. Inchon is where MacArthur began his fabled “End Run” around North Korean forces rolling them up and sending them in disarray retreating back toward Manchuria. Although Kil wasn’t exactly certain of the date, he was also involved in the atomic bomb tests in the desert southwest during the late 40s or early 50s. “I was a captain providing transportation for troops taking part in those nuclear tests. I got involved, too, in two or three of the tests” he said. “The scientists called the small atomic bombs ‘Devices.’ These bombs were mounted on steel towers, something like you might have a windmill on. “The troops were allowed to be about a mile from where the explosion took place. They were in a slit trench wearing dark goggles and steel helmets. They were cautioned to keep their heads down. If they got them above the trench, with the chin straps on, the wind from the explosion was so strong it could break their necks,” he said. When the Vietnam War arrived, Kil was sent to Saigon to help logistics expert supplying Allied forces over there. In 1967 Kil returned from Vietnam and retired from the U.S. Army ending a 25 year career in the service. Besides receiving a congratulatory letter from President Lyndon Johnson, he was awarded a Bronze Star for his logistical work in Vietnam. On Feb. 16 the mayor and city council of Rensselaer, NY. 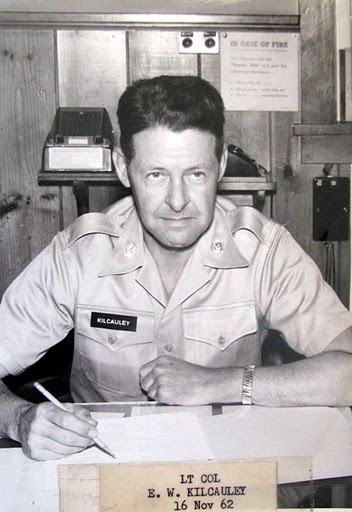 –Kil’s home town– proclaimed: “Col Kil Kilcauley Day” in honor of a favorite son and his service to his country. This story was first published in the Charlotte Sun newspaper, Port Charlotte, Florida on Monday, March 7, 2011 and is republished with permission. Click here to view the collection in the Library of Congress..
Elmer “Kil” Kilcauley, 99, peacefully passed on October 8, 2012. Elmer was born in Rensselaer, son of the late James W. Kilcauley and the late Cora (Wiltse) Kilcauley. 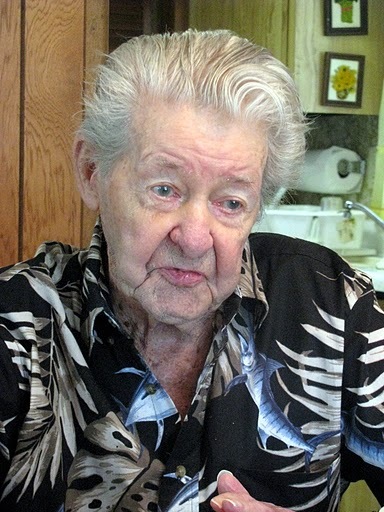 Elmer is survived by his wife of 66 years, Lois Kilcauley. Elmer received his education at Fort Crailo Elementary School, Rensselaer and The Milne School, Albany. 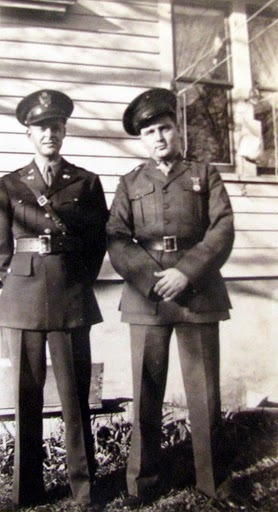 Elmer retired from the U.S. Army at the rank of Lt. Colonel. He was a veteran of World War II; drafted in 1941, and sent to Pearl Harbor. He was recalled for active duty to The Korean Conflict, served in Germany during The Berlin Crisis, called to Vietnam and was later awarded the Bronze Star for his logistics contribution there. February 2, 2011 was declared “Lt. Col. Elmer W. Kilcauley Day” by Mayor Dwyer in the City of Rensselaer. A certificate of congratulations and letter of commendation from the Rensselaer County Executive and County Legislature also awarded. Kil was known for his quick wit, soft-spoken one-liners, creative craftsmanship as shown in his rebuilding of houses, cars, kayaks, motors and cabinetry. He loved golfing, square dancing with his wife and daughters, and taking family on boat rides. He was a loving husband, father, grandfather, and brother to his sister, Elizabeth. Elmer is survived by his wife, Lois; two daughters, Karen (John) Thomas of Mass., and Linda (Roger) Dellaire, of Fla.; three grandchildren, Demian (Kristie) David of Mass., Jessica (Jason) Flaherty of Mass, and William (Shannan) Nowosielski of Mass; and five great-grandchildren. He is survived by several nieces and nephews, among them, William Campbell of Rensselaer, David Campbell of Portland, Ore., Cynthia O’Sullivan of Rensselaer, Ruth Clements of Troy, and a cousin. Elmer was predeceased by his sister, Elizabeth R. Campbell; and infant brother, Richard. A memorial service is planned for November 10 in Florida. Memorial donations may be made to Tidewell Hospice of North Port, Fla.
To express condolences to the family, and sign the online guest book, please visit http://www.Ltaylorfuneral.com. Arrangements by funeral director Larry Taylor Funeral and Cremation Services of Punta Gorda, Fla.